Dad, Husband, Banff local, and former full-time athlete. Aaron, as you’d expect from his former athlete status, is forever seeking out the next chance to hit the trail, ski run, or bike loop circuit, and get his heart racing; his love of sports and the outdoors runs through his veins. 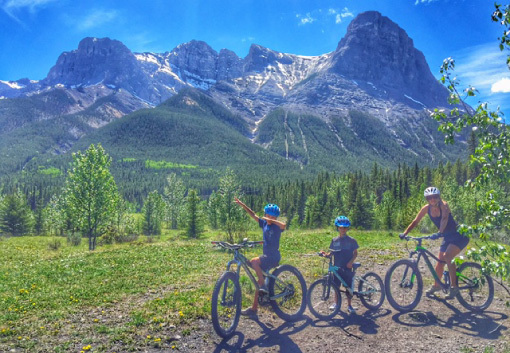 Coming from a passionate sports family, Aaron, who grew up in Calgary from Grades 1-6, was no stranger to Banff National Park, hitting Highway 1 every weekend to spend some active family time in the mountains – summer and winter. The ski season saw Aaron dutifully ride the bus from Calgary’s Chinook Centre, to compete in races at Mt. Norquay. Outside of race days, Aaron would often be skiing with his family at Sunshine Village and Lake Louise, perfecting his flair for ski. He loved the competition and the challenge of sports, and at that early age, was showing serious talent. This natural ability for sports lead Aaron to play tennis competitively by Grade 4, and by Grade 6, he was getting ready to swing into the Nationals. Representing the Province at this level from this early age, giving Aaron a taste for professional competition, and the serious side of sports. A family move to the Cayman Islands when Aaron was in Grade 7, meant that outside of his skill with a tennis racket, Aaron was introduced to his latest game of interest – golf. Through his teen years, Aaron pursued his commitment to both sports, golf and tennis, and – with the family now back in Canada, based out of Kelowna, B.C. – he decided to apply to U.S Universities, with his intention being to secure a Sports Scholarship. But, an unsuccessful tournament at that time unfortunately put that dream to an end. For Aaron, this was a difficult situation to accept, and this was to be the end of his professional journey with golf. It was then a move back to the Rockies – Aaron returned to Banff for a winter season and never left – that introduced him to a different sport again, bike racing. It was mountain biking to start, and after achieving success completing 24-hour challenge races and doing well, Aaron hopped over to the seat of a road bike. Road biking suited Aaron, and he was enjoying the challenge of taking his latest sport to the next level. Alongside some friends in Banff, Aaron was biking in a group. Together starting in Category 5, after constant practice, commitment and collection of points over time, suddenly, Aaron found himself working up to the top category. So now, life for Aaron – who was now also a family man, with his son Seth just one-year-old – was a racer’s life. As a full-time road biker, Aaron was training gruellingly hard. His schedule involved daily lunch rides and then specific evening rides. Aaron was committed, and from befriending a co-rider on the National team, also secured himself an expert nutritional consultant and trainer. This was also the time that Aaron was approached by the Wim & Nancy Pauw Foundation, a local non-profit organization that works to support Bow Valley athletes as they work to reach their sporting goals on the professional stage, as well as funding sports programs with community youth clubs. The Foundation, up until this point, had been providing annual funds to primarily cross-country ski athletes at the professional level, to contribute to the costs associated with competing on the international stage. Aaron, as a Banff local pursuing bike racing, was the first non-professional athlete to be offered a place onto the Wim & Nancy Pauw Foundation athlete support program, to which contributed to Aaron’s training costs. Aaron, now with two young boys at home, openly admits that balancing this level of commitment to a sport with family life day-to-day, was tough. Today, after achieving successes within his bike racing career, Aaron has been three years away from competing – deciding that continuing racing full-time and raising a family the way he wanted to, was impossible. “With two boys, I had to make a decision,” Aaron says. “It wasn’t possible to put my all into racing, and still be the present, engaged father I wanted to be. To stay at the top level of racing, you need to be all-in committed; constantly training. I knew I couldn’t do both, and I didn’t want to be mid or back of pack with my racing. The choice to be with my family won out. Reflecting back on his own relationship to sports, from childhood ski races to national tennis tournaments in his teens, Aaron is cautious to ensure his two boys, Seth (8), and Rory (6), adopt a healthy relationship to competition, understanding the importance of team spirit and taking part, over first places. Now, it’s about having fun and exposing the boys to as many different sports as possible. “When I decided to stop bike racing, it was the largest weight off my shoulders,” Aaron says, “the pressure was off, and sport was just enjoyable again. In a TIME article published in February 2015, ‘The Key to Making Your Kid a Star Athlete: Back Off,’ author Ted Spiker explores the subject of putting a damaging amount of pressure on young ones in sports; looking at how parents and coaches can promote a healthier, more playful attitude to team games and competition. This issue of parental pressure after practice, is a topic that was recently explored by the True Sport Foundation, which recently launched a national campaign encouraging parents to take a closer look at the language and approach used around sports. The campaign was centred around the ride home from the game, sharing the message that to keep kids interested and engaged in sports, it’s about knowing how to talk around competition. The ‘Ride Home’ campaign addresses the journey home as a great opportunity as a parent, to explore how their child is feeling about the game and allowing them to lead the conversation, without adding pressure or criticism. The non-serious approach is certainly one adopted by Aaron as he raises his own young boys with a passion for sports, minus the pressure. But Aaron is keen to point out that a fun, playful approach to family activities and sports is positive for young people. “Keeping them in sports gives them self-confidence, experience of teamwork, and focus. And for those parents, that want to embrace a more active lifestyle as a family, but don’t know where to start? “Start off small, and make sure it’s fun for the whole family,” Aaron advises. This approach by Aaron seems to be paying off, with Aaron’s boys both taking interest in a variety of both winter and summer sports. 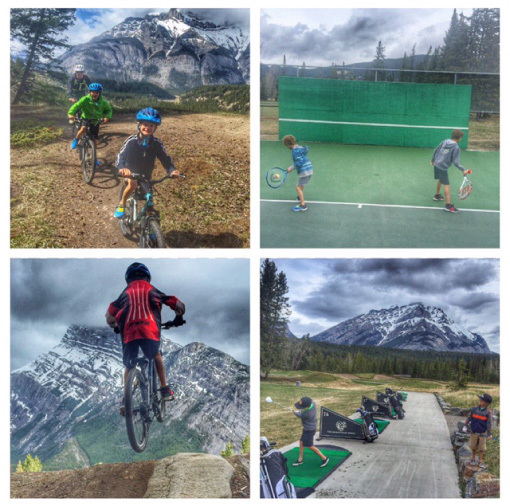 Aaron, Seth and Rory recently took on the Rocky Mountain Triathlon together, seeing them play golf, tennis and riding their bikes all in one day – but Aaron says the keenness to get involved with these active pursuits is very much coming from the boys themselves. Aaron Sands is a former athlete of the Wim & Nancy Pauw Foundation Youth Sport Fund, solely funded by the profits of Banff Lodging Co. (Caribou Properties). 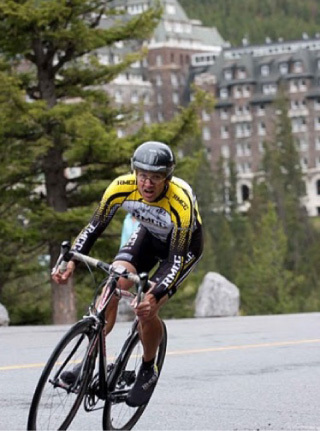 Aaron was actively approached by the Foundation, as a Banff local competing in road biking, to be a candidate to receive funds to cover the necessary costs of sports competitions and training supplies. Aaron received four years of support from the Youth Sport Fund, during his road bike competition career. Mt. Norquay is a partner of the Caribou Kids Season Pass Program. Under this program, in partnership with Ski Norquay, Caribou Properties has committed to purchase a Norquay season pass for all students at both the Banff Elementary School and the Banff High School. Every student at these schools has the opportunity to receive a Norquay season pass. This is part of Caribou Properties’ belief in supporting active, healthy lifestyles.